On April 9th 2013, The Daily Record, a conservative tabloid owned by The Dolan Company declared that “the 2013 legislative session is seen as business-friendly.” Since then, one of the primer newspapers in Maryland, the Trib­une-owned Baltimore Sun declared in an editorial on May 9th that one of Balti­more City’s premier business groups, the Greater Baltimore Committee, should “rally behind a proposal to adopt … calculating corporate income for tax purposes in exchange for a cut in the corporate tax rate.” The reason for this statement has its roots in what has happened in the recent legislative session in the Maryland General Assembly. For months now, I’ve been following these developments with great interest because they affect all Marylanders and show the power of what Jill Stein called the “dictatorship of the one percent” on the state level. It is important to discuss the background of this assault by business interests, the big, powerful corporations that hold power over the politics of the state. Business-friendly bills in the General Assembly were sponsored by those I call the “dirty 18” because they are connected to the American Legis­lative Exchange Council (ALEC). ALEC is a bill mill that gives state legislators so-called “model bills” that cater to their cause and benefit business interests in some way, including Stand Your Ground laws, ag-gag laws and many others. 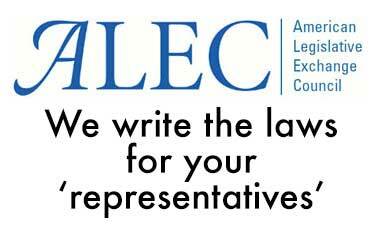 In Mary­land, the laws introduced or sponsored by ALEC members who were Republican legislators lowered corporate income taxes, gave businesses deductions for property tax, or created a tax holiday for corporations. While all of these bills failed, other bills sponsored by Democrats did pass, including a bill giving Lockheed Martin a tax-free zone encompassing its Montgomery County hotel, and bills keeping the biotechnology tax credit alive, “im­­proving” public-private partnerships, in­creasing textbook aid to private schools, and cutting $7 million to the mental health program. In ad­dition the gas tax, which was sold as putting funds toward transportation, partly directs such money to projects favored by business groups such as the “light rail.” The passage of these bills proves that there is a bipartisan policy in place to benefit business interests in Maryland and not necessarily the needs of the community. Despite these efforts, as civil society groups applied pressure on legislators, there were some victories for the people of Maryland. There was approval of legislation to allow gay marriage, repeal of the death penalty, and a bill allowing driver’s licenses to be given to undocumented immigrants who have lived in the state for over two years. In addition there were bills passed in gun control banning different types of assault weapons, a clamping down on corporations who make multiple campaign contributions, and a wind energy bill. Even with these successes, the policies benefiting big corporations won out this legislative session. What can be done? For one, don’t support the two establishment parties. The Dem­o­crats, led by Governor Martin O’Malley, hold the strength on the urban areas of Maryland such as Baltimore City. And the Republicans must not be looked to for solutions. They were responsible for legalizing gambling in 2007, which was supposed to be the big money maker to stop a budget shortfall. Now, since it was a constitutional amendment which cannot be changed without another referendum, it has become a tax on the poor that has led to huge profits for casino-operators and companies building the casinos. The Maryland Green Party which does not accept contributions from PACs, corporations, or labor unions is a viable alternative to these two corporate parties by supporting candidates who, in their words, value “grassroots democracy, social and economic justice, ecological wisdom, and peace and non-violence.” In the end, Green Party members and others must begin to work with civil society groups across Mar­yland to build opposition to future business-friendly efforts during the next year and the 2014 legislative session. Not supporting either major party has actually been working out well for me. One does not have to be a member of either party to have an influence on politics, policies, and legislation. I can be a member of social movements, professional organizations, or groups on college which are not associated with either party. It isn’t that hard. If those who oppose the two parties were seen as politically irrelevant, then there would be no need to marginalize them. Yet, they are seen as politically relevant by the powers that be, leading to the marginalization of such voices. I would not say I have changed “nothing.” I have engaged in social change while at college, built projects, and reconnected with people I didn’t know in my family before. So, if there is anyone who is self-righteous, its you, not me.